UNLESS YOU EAT THE FLESH OF THE SON OF MAN AND DRINK HIS BLOOD, YOU DO NOT HAVE LIFE WITHIN YOU. Our readings this Sunday continue the exploration of the Eucharist and its true significance in our lives. We have our third of four segments of the Bread of Life Discourse from the Gospel of John, chapter 6; and we have an Old Testament invitation to a banquet that prefigures the Eucharist. In our first reading (Proverbs 9:1-6), Lady Wisdom builds her house of seven columns (signifying perfection or completeness) and invites us to her banquet of food and wine. In her house is wisdom, understanding and life. Wisdom has built her house, she has set up her seven columns; she has dressed her meat, mixed her wine, yes, she has spread her table. She has sent out her maidens; she calls from the heights out over the city: "Let whoever is simple turn in here; To the one who lacks understanding, she says, Come, eat of my food, and drink of the wine I have mixed! Forsake foolishness that you may live; advance in the way of understanding. 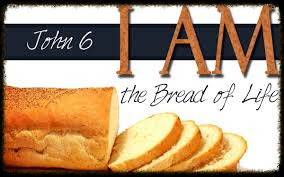 In our Gospel reading (John 6:51-58), Jesus tells his listeners not only is he "the living bread that come down from heaven" but that this food is his actual flesh and actual blood. Jesus leaves no doubt that he is speaking literally and not metaphorically or symbolically. His listeners have great difficulty in hearing this. The Jews quarreled among themselves, saying, "How can this man give us his flesh to eat?" Jesus said to them, "Amen, amen, I say to you, unless you eat the flesh of the Son of Man and drink his blood, you do not have life within you. Whoever eats my flesh and drinks my blood has eternal life, and I will raise him on the last day. For my flesh is true food, and my blood is true drink. Whoever eats my flesh and drinks my blood remains in me and I in him. Just as the living Father sent me and I have life because of the Father, so also the one who feeds on me will have life because of me. This is the bread that came down from heaven. Unlike your ancestors who ate and still died, whoever eats this bread will live forever." In our Epistle reading (Ephesians 5:15-20), St. Paul echos the invitation found in our first reading to live with wisdom, not as foolish persons. This is what "living in the Spirit" means. Brothers and sisters: Watch carefully how you live, not as foolish persons but as wise, making the most of the opportunity, because the days are evil. Therefore, do not continue in ignorance, but try to understand what is the will of the Lord. And do not get drunk on wine, in which lies debauchery, but be filled with the Spirit, addressing one another in psalms and hymns and spiritual songs, singing and playing to the Lord in your hearts, giving thanks always and for everything in the name of our Lord Jesus Christ to God the Father. Over these past four weeks, our story is becoming clearer. We started with the miracle of Jesus feeding five thousand people with just a few loaves and fishes. But this food nourished the body only and not the soul. We have since learned that Jesus feeds us with his very life - his own flesh and blood. This is the life he gave us on the cross and continues to give us in the Eucharist every day. This is impossible to accept and understand unless we can first accept the divinity of Jesus. Then it all makes sense. That is what the "Jews" in our Gospel readings could not understand. Thank God we do.